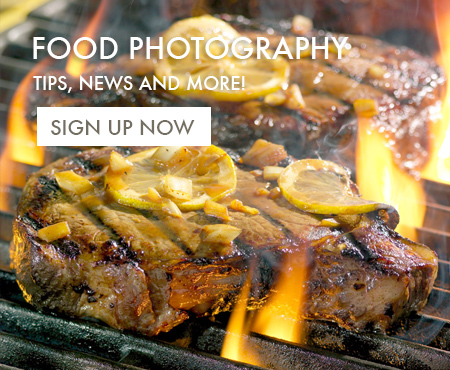 Michael Ray gives how professional food photographers capture steam in their photos. I was recently on a food photography group where the topic of the day was “what’s the hardest thing for you to photograph”. Several of the group’s participants stated that they had a very difficult time photographing steam. Coincidentally, I was in the middle of photographing a three-day steamed vegetable food-packaging shoot. Since I had just had to deal with this very problem, I thought I’d document what went into a professional food photography job where capturing steam was a very important aspect of the shoot. The images and information (tips and tricks) below are from that shoot. First off, let me tell you that very rarely am I ask to produce steam any more. It seams in this day of digital retouching, it’s easier to retouch in steam instead of shoot it. A re-toucher can put the steam where they want it and in exactly the right amount, where as photographers must do the best they can and hope for it turns out. And most of the time, the retouched steam doesn’t look too unrealistic. Producing and photographing steam tends to be a “hit or miss” kind of thing. Photographing steam is sort of like the definition of chaos. There are so many things that go into photographing steam, that it’s very difficult to control all the variables. The temperature of the food in relation to the surrounding air conditions are, of course very important, but there are things physically and photographically that you can do the improve your odds of successfully capturing steam in your food photography. One of the toughest variables is the actual wind current in the photo studio. 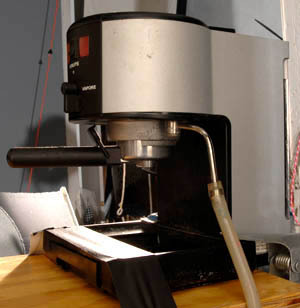 Even a slight draft from the heater or air conditioner will greatly affect the shape and direction of the steam. Even the slight draft created by the stylist’s arm will cause a draft that makes the steam take a particular shape. Sometimes those affects will be a positive “happy accident”, but most times they will not. Happy accident or not, the effects of all these subtle influences are seldom repeatable. In other words, if something happens that you really like, its rare that the same situation can be reconstructed so that the same effect can be captured a second time. I can’t tell you how many times I’ve been asked by Art Directors to make a steam effect on a shot that had a white background. Think about it. Steam is white AND somewhat transparent, so it makes sense (at least to a studio photographer) that you can’t make something separate that’s white from something else that’s white. Well, sometimes you can, but not steam. I’m sure you’re seen white on white portraits or shots of eggs on a white background, right? So you say, how come steam can’t separate from white when eggs can? The answer is simple. Eggs have an edge (visually), where something transparent, like steam, does not. Separating the steam from the background is often a problem if you have to shoot on the light colored surface. The best way around this photographic problem is to simply choosing a darker colored background. To make two things separate that are the same color, you need to light on of those things so that they are brighter than the other thing, thus causing separation. You need contrast. If one of those things is transparent, there is no real edge to light, to create separation. To create separation, you need contrast. That’s why you need a dark background to see the steam. Notice on the big corn shots above where the steam is coming off of the corn. There are places where the steam is coming off the corn and overlapping the white bowl. You can’t see the steam where it overlaps the bowl because the bowl is white, can you? It would be the same thing if the background were white, only worse. At least the white bowl is in shadow where a white background is really white. Notice that I didn’t say that you needed heat. I said you needed steam. Most amateur photographers think that the object being photographed needs to be the thing creating the steam. That is rarely the fact. Sure, sometimes it is, but most of the time it isn’t. The reason most steam is added to the shot is because it is difficult to create the desired composition quickly enough to make everyone happy and have the subject still hot enough to create steam. I most cases, the steam is made by either a steamer of some kind of smoking object like a cigarette or a “smoke cookie”. Take the corn shot (below) for example. If you think that we just dumped all that corn into a bowl hot and took a shot, you are mistaken. Each and every kernel of corn was looked at and adjusted, if it wasn’t looking just right. Notice how you can’t see up the bottom of any of the kernels. Notice how the shape of the mound of corn is almost perfect. Notice how the kernels on the side of the mound sort of poke up and make an interesting surface. All that doesn’t happen by accident. The food stylist probably sat there and poked around with a stick for over a half hour to get things just the way the Art Director wanted. Nothing will be hot after that long sitting on set. So what was the solution? We add steam from a steamer. Actually, the steamer was a modified cappuccino machine. The stylist blasted the corn with steam for maybe 20 seconds or so and then took away the steamer nozzle so that I could shoot it. Then we would repeat the process until we had something we liked. 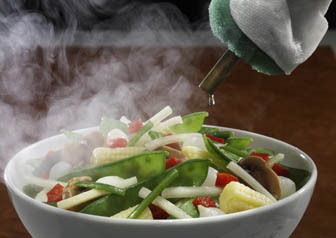 We probably shot 30-50 shots of each vegetable with different amounts of steam. There were a couple of tricks we learned as we went. One trick was that we didn’t apply the steam to the front of the bowl of corn. If we did, the steam tended to haze out the corn. And if you’re trying to sell corn, the client likes to actually show the corn :+). So we tended to apply steam to the rear and middle of the bowl. Another thing we experimented with was the length of time we applied steam to the bowl. As the steaming progressed, the corn actually started heating up and the steam would linger longer that when we first started the process. We also experimented with how broadly we applied steam over the width of the bowl. We determined that to look natural, the majority of the steam needed to come from the middle of the bowl, and not the entire width of the bowl. Another thing we determined through trial and error, that the steam needed to dissipate quite a bit to look normal. Too much steam really didn’t look very real, so if we let it settle the steam tended to loose some of the density and also some of the eddies created by the stylist withdrawing the steamer from the shot. The last thing you need to create a good steam photograph is back-light. Without back-light, you’ll never get the true effect of steam. It’s the light coming through the steam that really makes it light up. On these veggie photos, I actually have two lights coming from the rear of the set. My main light is off of the right rear and my steam light is off to the left. It’s hard to see from the photographs I’ve included here but the steam light (from the left) is about the same height as the bowl. That way, the photographic light tends not to affect the veggies very much but only the steam protruding above the bowl. I actually flagged off the steam light so that it didn’t hit the bowl or the background. It’s only lighting the steam and a few of the veggies that poke out of the top of the bowl. How bright should you make the steam light? It’s all trial and error. Shoot and adjust. That’s one of the great things about digital photography, you can shoot and then adjust as many times as you need to without it costing you anything. In the “old days” of film, we would of need to shoot tons of Polaroids. And we would have needed to shoot probably 100 shots instead of thirty to get what we needed. With digital, you get to see what you have and then stop when you’re happy. With film, you wouldn’t know what you had until the film came back from the lab. So to make sure that you had something good, you would need to take lots and lots of shots and even then you wouldn’t be sure that you had something good. With digital, you know you have it before the shoot is over. That wasn’t the case with film. You just hoped that you had something good. This was shot without a back light. This was shot with a back light. Besides showing much more steam, look at the added dimension of the corn. Here’s the basic lighting diagram from my food-packaging shoot. 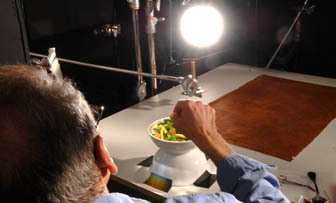 The main light is a 10” freznel spot light coming from 2:00, positioned relatively high so as to light into the bowl. The steam light is coming from 11:00 and is positioned low enough so that it does not affect the veggies too much. The flag is so that the steam light does not light the bowl, only the corn and steam. The mirror helps to light the side of the corn that is in the main light’s shadow. 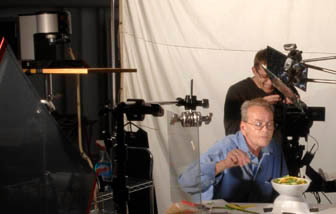 The two fill lights behind the camera are diffused by a 10’x10’ silk, to provide a “true fill” effect. 1. If you haven’t already, please Join my mailing list. 2. Leave a comment letting me know what you thought of the post (below). 3. Ask me a question (in the comment section below) that I can use to come up with more ideas for blog content. Thank you for taking the time to create this very instructive posing. When photographing on location in restaurants, I take those little cones of incense with me to create “steam”. One other suggestion I’ve heard is a soaked tampon, microwaved for the appropriate amount of time. When removed from the microwave, it will continue creating steam for quite a long time. Works well with wider shots, when placed right behind the product. That’s a good one that I’ve never heard of before. I might make a list of these!